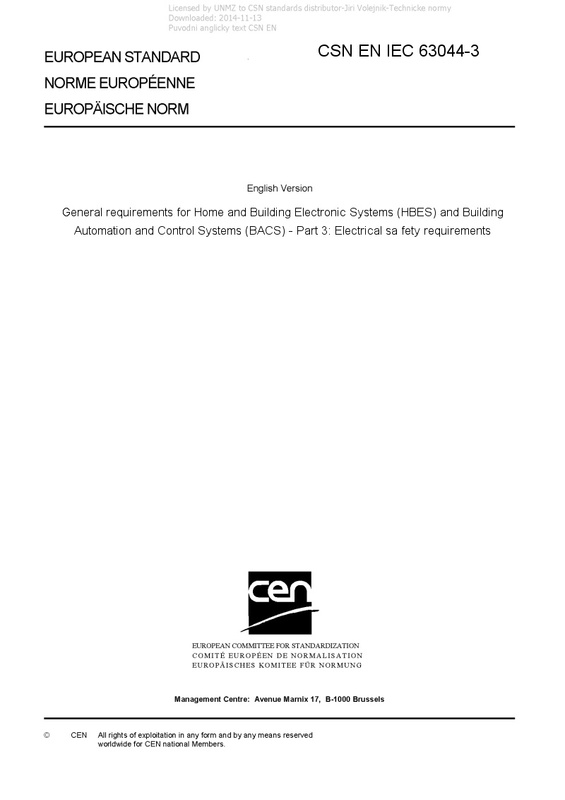 EN IEC 63044-3 General requirements for Home and Building Electronic Systems (HBES) and Building Automation and Control Systems (BACS) - Part 3: Electrical sa fety requirements - IEC 63044-3:2017 provides the electrical safety requirements related to the HBES/BACS network in addition to the product safety standards for HBES/BACS devices. It also applies to devices used within an HBES/BACS network for which no specific HBES/BACS product safety standard exists. In addition, it defines safety requirements for the interface of equipment intended to be connected to an HBES/BACS network. It does not apply to interfaces to other networks. NOTE An example of other networks is a dedicated ICT network covered by IEC 62949. This document is applicable to operator stations and other human–system interface devices, devices for management functions, control devices, automation stations and application-specific controllers, field devices and their interfaces, and cabling and interconnection of devices used within a dedicated HBES/BACS network. This document covers the following requirements and compliance criteria: protection from hazards in the device; protection from overvoltages on the network; protection from touch current; protection from hazards caused by different types of circuit; protection of the communication wiring from overheating caused by excessive current.